One of the country’s leading property auctioneers is going back to the job he loves this week as he takes to the rostrum once again at Villa Park following an absence of 12 months. Rory Daly, Auctioneer at SDL Auctions, took time off from his job last year after he was diagnosed with bowel cancer. Thankfully Rory has made a full recovery and has now been given the all clear to return to work and what better day to return to his passion than Valentine’s Day. The first SDL Auctions Bigwood auction of the year takes place this Thursday 14th February at Villa Park football ground and with a catalogue totalling 136 lots there’s likely to be plenty of love in the air. Even the BBC 1 Homes under the Hammer film crew are coming along to play property matchmaker! 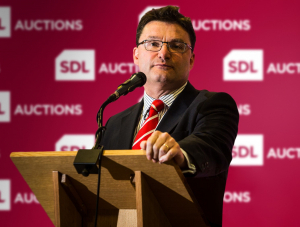 Rory will now be refocusing his time on SDL Auctions’ corporate relationships across the West Midlands and the rest of the UK, as well as taking to the rostrum as lead auctioneer for the 2019 calendar of 40 room auction sales alongside Andrew Parker and Graham Penny. Rory added: “We’re starting 2019 on the back of a hugely successful 2018 where we not only sold more than 725 lots in our Villa Park auction room – the most of any auctioneer in the region – and were named Company of the Year at the Birmingham Post Business Awards, we also raised a fantastic £210m in sales for our happy sellers across the UK. To view the catalogue for the Thursday 14th February auction at Villa Park FC click here and to see the full 2019 calendar of auctions click here.